Natchitoches Parish Sheriff’s Deputies and Robeline Police arrested a DeSoto Parish man on felony drug charges during a traffic stop in Robeline Tuesday, Aug. 8 at 3:40 p.m. Robeline Police contacted the Natchitoches Parish Sheriff’s Office requesting assistance with a traffic stop in the parking lot of a business on La. Hwy 6 West in Robeline. Deputies identified the operator of the vehicle as Randall Wayne McCart, 40, of Logansport. 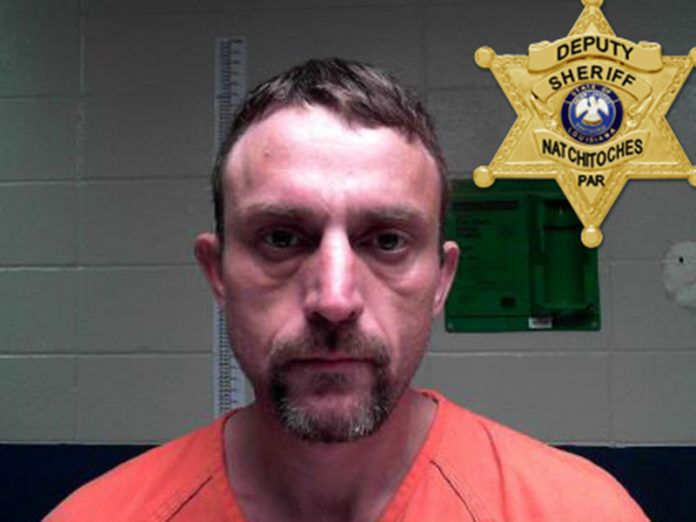 A local warrants check revealed McCart was wanted by the Tenth Judicial District Court for Failure to Appear since April 2004 for Simple Battery. During the traffic stop, Robeline Police observed McCart acting suspiciously leading them to believe criminal activity existed. While speaking to a passenger in the vehicle, deputies learned of possible narcotics in the vehicle. During a search of the vehicle, deputies seized approximately 2 grams of suspected methamphetamine, smoking apparatuses commonly used to smoke illegal narcotics and weighing scales. McCart, of the 300 block of East Street, Logansport was charged with Failure to Appear in the 10th Judicial District Court for Simple Battery, Possession of CDS Schedule II Methamphetamine, Possession of Drug Paraphernalia and traffic offenses. A Tenth Judicial District Court Judge set bond at $6,000. Deputy S. Axsom made the arrest assisted by Robeline Police.